STS-7 Mission Specialist Sally Ride poses on aft flight deck with her back to the on orbit station (Credit: NASA). 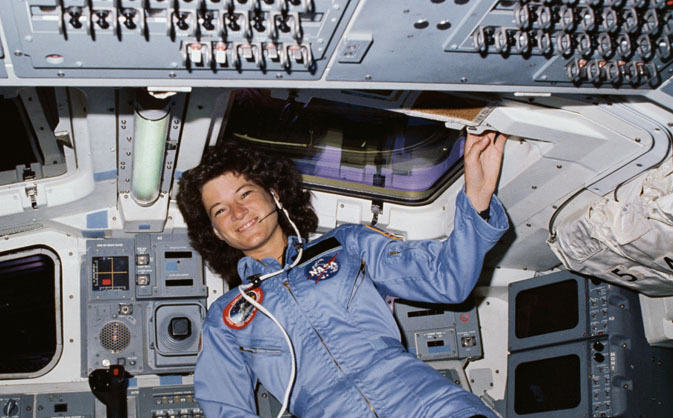 Sally Ride was born in Los Angeles, California, on May 26, 1951. Fascinated by science from a young age, she pursued the study of physics, along with English, in school. As she was graduating from Stanford University with a Ph.D. in physics, having done research in astrophysics and free electron laser physics, Ride noticed a newspaper ad for NASA astronauts. She turned in an application, along with 8,000 other people, and was one of only 35 chosen to join the astronaut corps. Joining NASA in 1978, she served as the ground-based capsule communicator, or capcom, for the second and third space shuttle missions (STS- 2 and STS-3) and helped with development of the space shuttle’s robotic arm. Ride continued her career with NASA after her historic flight, flying on a second shuttle mission (STS-41G) in October 1984. She later served on the presidential commission that investigated the Challenger accident and led NASA’s strategic planning effort in the mid-1980s. Retiring from NASA in 1987, she became a science fellow at the Center for International Security and Arms Control at Stanford University and, in 1989, joined the University of California-San Diego as a professor of physics and director of the California Space Institute. In 2001, she founded her own company, Sally Ride Science, to pursue her passion for motivating girls and boys to study the STEM fields—science, technology, engineering and math. The company creates innovative classroom materials, programs and professional development training for teachers. In 2003 she also served on the presidential commission investigating the Columbia accident (the only person to serve on both commissions). In addition to this work, she wrote a number of science books for children, including The Third Planet, which won the American Institute of Physics Children’s Science Writing Award in 1995. Following a 17-month long battle with pancreatic cancer, Sally Ride died on June 23, 2012, leaving behind a heroic legacy. Almost exactly 20 years prior to Sally Ride’s first Shuttle mission, on the morning of June 16, 1963, Vostok 6 blasted off on a mission of 48 orbits around the Earth. While orbiting the Earth for almost three days, Valentina Tereshkova conducted a number of experiments, took photographs and recorded flight notes. 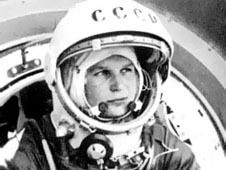 Although she would never fly again, her role in the historic flight was a significant public relations coup for the Soviet Union and her moving life story and accomplishments were held up as an example for others to follow. Her voyage, like Sally Ride’s, inspired women around the world to reach for their dreams and shoot for the stars. Following her flight, Tereshkova was swept into Soviet politics, serving as a member of the Supreme Soviet, the Presidium of the Supreme Soviet and the Central Committee of the Communist Party. She also became a well-known representative of the Soviet Union abroad, acting as the Soviet representative to the UN Conference for the International Women’s Year in 1975 and leading the Soviet delegation to the World Conference on Women in Copenhagen. She was awarded the Joliot-Curie Gold Medal of Peace for her work with the World Peace Council. Valentina Tereshkova, the first woman in space, flew 20 years and 2 days before Sally Ride, the first American woman to follow in her footsteps (Credits: NASA). Sally Ride and Valentina Tereshkova, as the first women from their respective countries to fly in space, helped to usher in an era of equality in human spaceflight. On the anniversary of the missions which launched them off the Earth, the legacies of their historic flights remind us of the hard work, passion and dedication of the women who have worked on the ground and in space to pave the way for 55 more women (and counting) who have since journeyed into space.